After the Italian leg, it was time to go to Serbia! Serbia, here I come ! 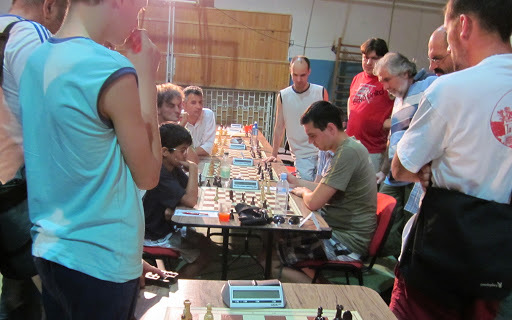 Serbia is a special place for Chess. Everyone appears to know chess. Even the cab drivers talk about chess. 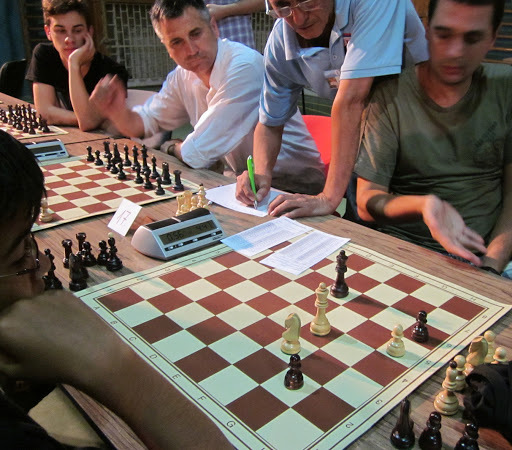 Serbia is no longer the force it used to be in Chess. The war, newer job opportunities, and the present slow economy (as I was told) has taken its toll. I learnt there is much less government support for the chess game now. But Chess lives in Serbian hearts. 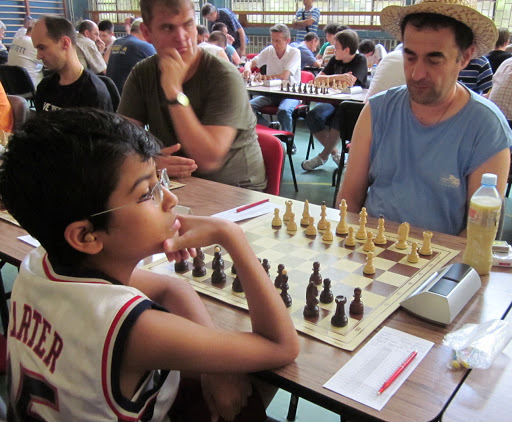 At one time Serbia had the highest ratio of Chess Grandmasters (GM)/Population of any country. 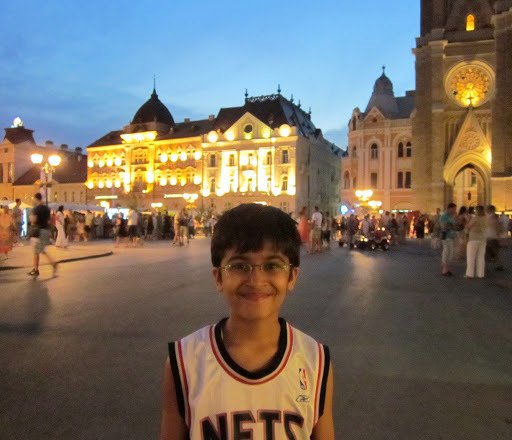 I visited Belgrade, and then headed out to Novi Sad for the “3rd International Chess Championship of Vojvodina 2012.” We stayed near the market square area. It’s a rectangular-shaped area with a beautifully constructed soaring Gothic architecture Church at one end, accompanied with many old-style elegant architecture buildings around the rectangle. 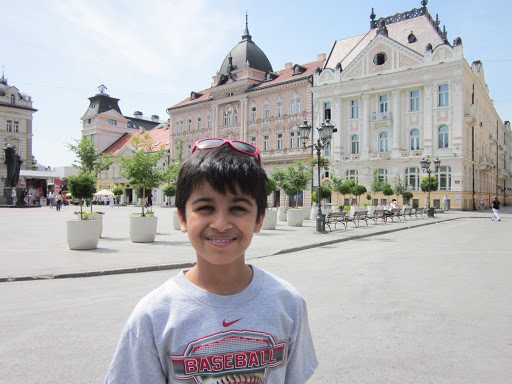 Well, I liked the section of Novi Sad where we stayed. It’s pretty, plenty of restaurants, and attracts a lot of young people in the evenings – it’s a popular meeting area. This part of the city is alive with parties going strong all night till early hours of the morning. And if a soccer game or a tennis match featuring the popular Serbian tennis ace Novak Djokovic is going on, then the noise gets real loud. Restaurants put out tables and chairs in the promenade with big television screens, and everyone has a blast. English is not widely spoken, but you always end up finding someone who could talk sufficient English. 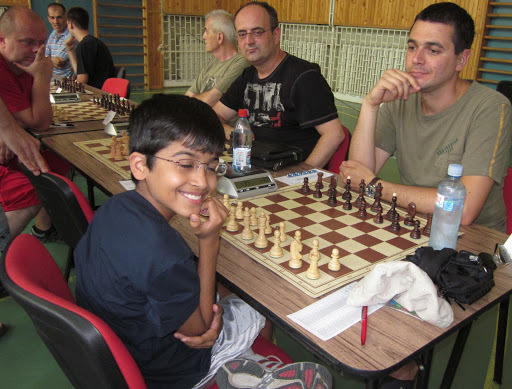 In R2, I was paired with IM Dejan Leskur and it was an uneventful Draw. 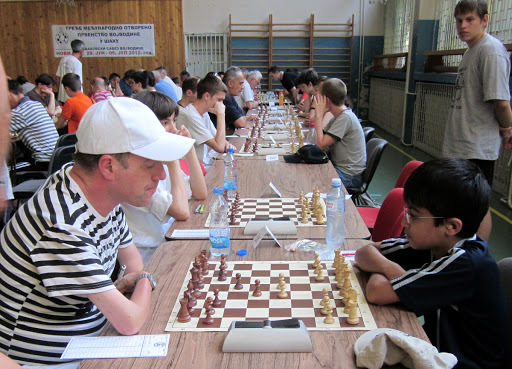 Next was Vladimir Klasan, a 2345 Elo rated player. This game was absolutely nuts and very long. I got a superior position out of the Opening. But then I surrendered the advantage with one weak move that shifted the initiative to Vladimir. It cost me a Pawn, but I was confident that I can turn the tables on Vladimir as he was getting into time trouble. I sacrificed another Pawn to proceed into an endgame, where my King was extremely active with chances of a mating net while the opponent’s pieces were uncoordinated. As I had anticipated, Vladimir blundered and I went on to further simplify the game. I began tightening my grip on the game, and was an exchange up. It was 2 pawns for Vladimir Vs my Knight and a Pawn. Right then the blunder came – this time it was mine. I had to stop Vladimir’s Pawn immediately, two squares from Queening, and then move the King. Instead I reversed the sequence. Consequently, his Pawn became a square away from Queening and I’d to devote my Knight to guard the Pawn. The right sequence was to block first and then move my King to defend my white Pawn on 5th rank. I played on for quite some time trying to hope for a mistake from him, but it was almost impossible to make one. I had just blown the game! Not the first time, and it a’int going to be the last. 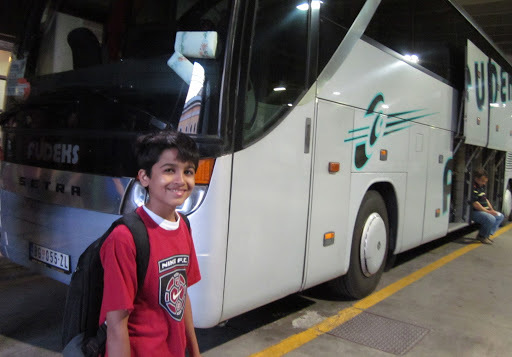 Had to move on – Chess teaches you that. I settled for a disappointing Draw 🙁 . A tiring game! Here he is! 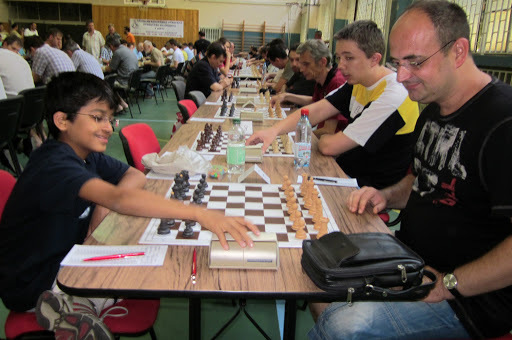 Akshat Chandra and IM Dejan Leskur playing Chess R2. 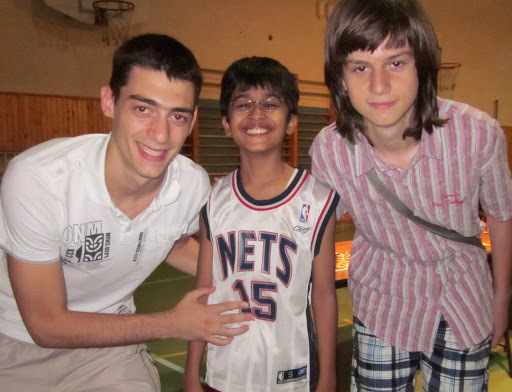 Akshat Chandra and Vladimir Klasan. It was a 5-hour long Chess game! 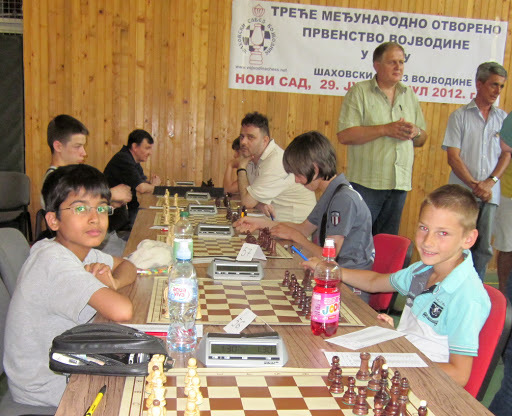 Akshat Chandra and Vladimir Klasan. The Final Position! 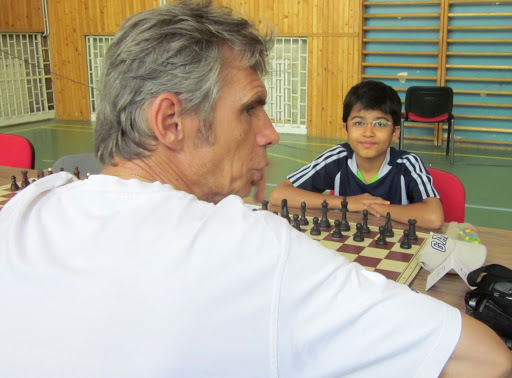 Chess Chief Arbiter IA Boban Milojevic signed the sheet. 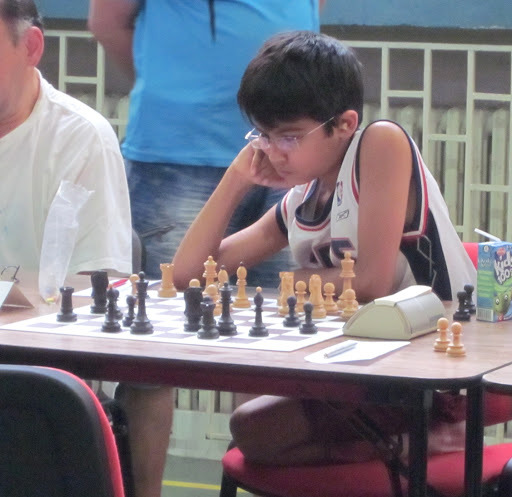 In the 4th round I was paired with GM Goran Kosanovic. I was better out of the Opening, but I didn’t attack. I kind of just developed and waited for him to create some weaknesses. We went into a chess endgame where I was completely passive. It might have been tenable, but after 2 hours I just gave up. It was disappointing, since I didn’t really put up a strong fight. The next round was with a lower rated, ELO 1975, and I won that without any issues. 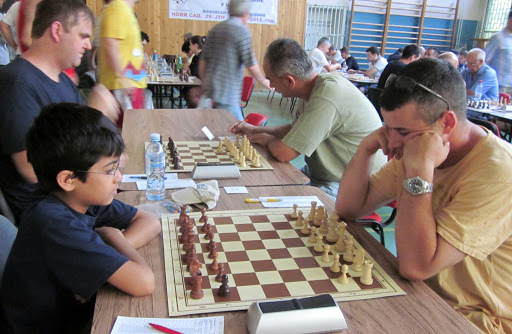 In the 6th round, I played with a local chess player Nenad Dimitrijevic, who had an ELO of 2255. I tried to complicate the game for him by sacrificing a Pawn for open lines on the queenside – kind of like the Volga Gambit chess idea. But it wasn’t enough and after exchanging all the queenside pawns, we simplified into a 4 Vs 4 rook endgame and Drew. The next round I got paired with a 1795, which was really surprising and disappointing since I was expecting a higher-rated chess player. There was not much to do that morning in terms of preparation. So I just walked around with my Dad around the city, and then showed up to play. It was a fairly comfortable win. 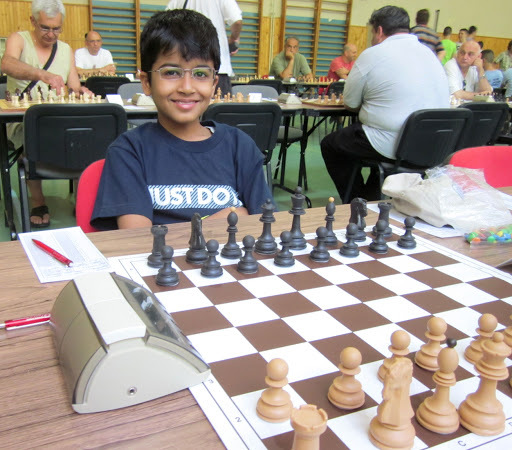 Akshat Chandra and Nenad Dimitrijevic in Chess Round 6. 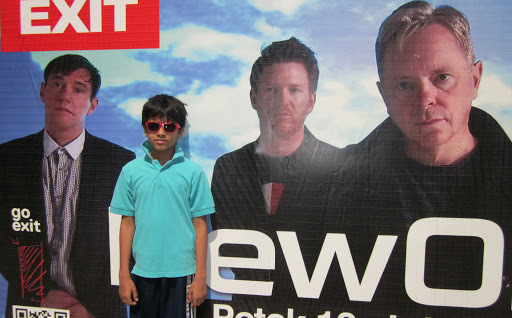 You can see Andrew Stone from England next to me. the Serbian Summer to play here. Deep Chess Thinking, but couldn’t breakout. 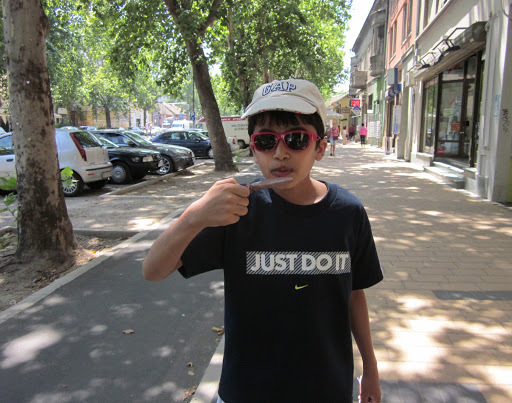 Akshat beating the Novi Sad July heat! 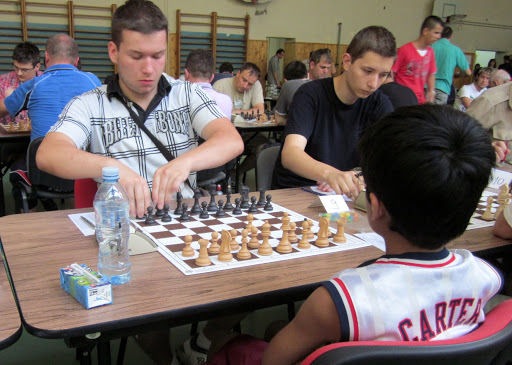 In the penultimate round, I was paired with a Chess FM Milenko Pucarevic. Milenko showed up in a straw hat and a blue sleevelet, and I nicknamed him “Cowboy.” Milenko started the Chess game with a 1.b4 opening! Now that was really surprising. Milenko sacrificed a pawn early on and then couldn’t get his compensation. I had to be very careful, and after some accurate calculations I built my position up and finally lassoed Milenko. It was a fun win! 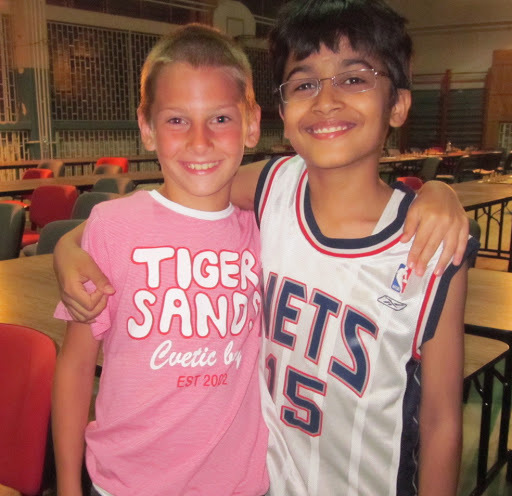 The chess tournament was coming to an end, and in the final round I was paired with IM Lazar Nestorovic. He surprised me in the opening. I began to play quite weirdly, as I was desperate for some play. 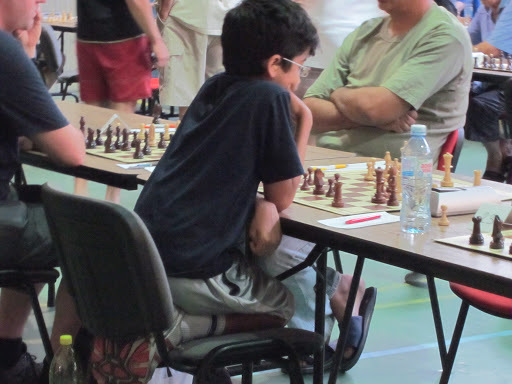 IM Lazar made a mistake in the middlegame, and that put me a bit ahead. But he had two Bishops, which were not be compromised that day. Without a compelling advantage, I didn’t have much choice but to repeat moves. My final chess game of this tournament was a Draw. I finished the tournament with 6/9, which was good enough to get me a runner-up prize in the U16 section. I got a chess set, and a FIDE digital timepiece (from a Blitz edition earlier). Not a bad haul, I would say 🙂 . It was time to move on. The next morning my Dad and I took the bus back to Belgrade, where we met my brother and Mom – after close to 2 months. It felt really good meeting them. 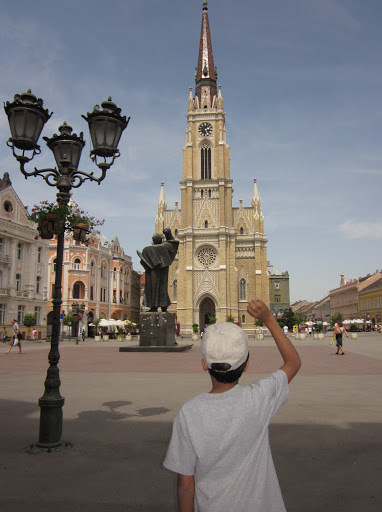 If you ever happen to be in Belgrade, do take a quick trip to Novi Sad church square. You’ll like it. 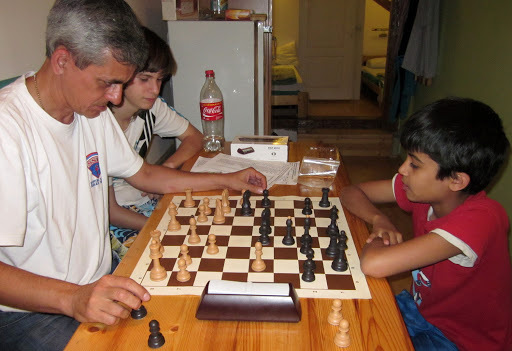 Midnight Chess Blitz session with Chief Arbiter IA Boban Milojevic with Nikola watching us. used to often drop-us off at our hotel after late night games. Coming soon to your TV – the Fab 4! 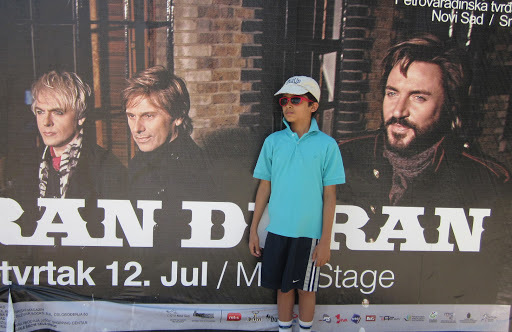 These billboards are filled with cool guys!